This blog post started with gibberish thinking. I was distracted before writing this blog post and you can see why it's no good for your productivity and who you’re communicating to. We sometimes don’t even notice that we are being repeatedly distracted from our work. The first step is assessing what is a distraction. Take note at how often you reach for your phone, switch to email or browsing the internet with no purpose. Anything that you’re not supposed to be doing right now is a distraction. Start becoming aware so you begin to take control. And that means, all chances. Do you work on a desktop/laptop? How many tabs do you have open in your browser? And how many of them are relevant to the work you’re doing? You might have Facebook open and the urge to check your notifications is strong so you end up checking the notification because that little number is demanding attention from you. Close distracting tabs. Close all apps that are not relevant to the job you’re working on. You have to ensure there’s no potential for distraction in your area of work. Your productivity instantly goes downhill when something cuts your workflow. Studies have shown it takes 25 minutes to regain focus. 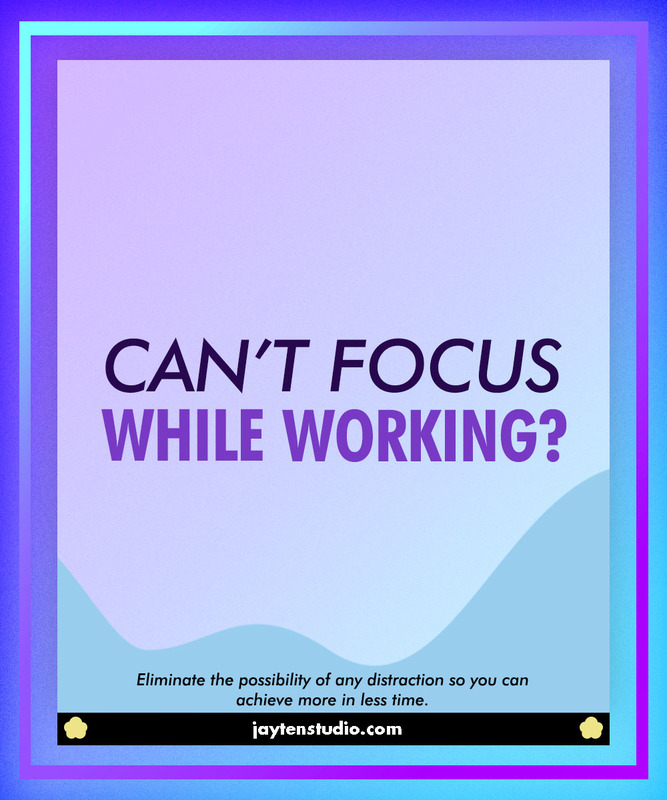 If you add up the amount of distractions in a day, for this example we’ll say five (distractions include answering messages, co-workers, advertisements) and then multiply that by the amount of time it takes to become focused again, the answer is 125 minutes. And boy, that’s a significant amount of time. Two hours of your eight hour working day has been lost. And I can only imagine people are more prone to distractions than I am. Now this might offend some people, but I tend not to answer phone calls that have not been scheduled. I’ve turned off email notifications on my desktop and phone. Sometimes I do occasionally turn my email phone alerts on because I’m waiting for client feedback or reading an email course. Really block out a time to work on something that day. Could be an hour, or two hours because you can really get more work done that what some people can do in a eight hour day of being half-focussed. As long as these distractions are prevented while you work, you’re able to focus on what’s in front of you. When I first started working in coffee shops, I hid my phone. I’d work for 30 minutes and spend those 30 minutes solely working—no checking socials, no checking messages, no emails. Just solid focus on writing or designing. Then I’d check my phone for 5 minutes. Giving yourself a little award can help you stay focused. But be strict, only set yourself a set number of time to check messages and notifications and reply to the messages relating to your work. Replying to what’s for dinner is not an urgent—save that for another time in the day like on your lunch. With training, you will be able to have your phone next to you while you work which is what I do now. I set timers and since notifications are off, no push notifications will be appearing while I work. Old habits die hard and I would find the urge to check Twitter. As soon as my eyes lean over the my right where my phone is laying down, I mind slap my brain and say nope, not yet. Write down the exact time of the day you’ll be having your focused block of time. Commit to it. Your 90 minute block or two hour block is sacred. This is your time to do work that’s important to you. Reward yourself only once you completed your focused session. That down-time is also important.